How to Model Multi-Party Service in SoaML? Current: How to Model Multi-Party Service in SoaML? Multi-party service contracts refer to services that involve the participation of more than two participants, and with interaction between one another. An example would be an escrow purchase service where an order is made by purchaser, mediated through escrow agent and delivered by product provider. Escrow purchase service is a multi-party service not just because it involves the participation of three different parties, but also because each participant has to interact with all the other participants throughout the service. This tutorial is written to explain what is meant by multi-party service in terms of SoaML and how to specify such service with various SoaML diagrams in Visual Paradigm. The example that will be used in this tutorial is about paying tax through online bank account. You will draw different SoaML diagrams to specify the tax payment service. In order to complete this tutorial, make sure you have Visual Paradigm downloaded and installed. Click here to download Visual Paradigm if you do not have it installed. You are expected to have basic understanding of SOA, SoaML and how to develop SOA with SoaML using Visual Paradigm. If you are unclear about any of these topics, please read the tutorial - How to Draw SoaML Diagrams? first. In a multi-service contract, all participants provide their own interface and use the interfaces of each party they call. 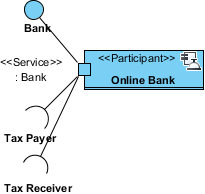 Let's draw a service interface diagram for the three interfaces - Tax Payer, Tax Receiver, Bank. In a new project, create a service interface diagram by selecting Diagram > New from the toolbar. In the New Diagram window, enter Service Interface Diagram in the search field, click Next. Then, fill in the Diagram Name and Description (if any), click OK to confirm diagram creation. We are going to draw the three interfaces. Expand the Service Interface tool in the diagram toolbar and select Interface. Let's create an interface for tax payer. Click on the diagram to create an interface and name it Tax Payer. Create two more interfaces - Tax Receiver and Bank. That's all for now. In each interface, there should be operations (or signals) to be invoked by others, but we are not going to specify them now. When we define the choreography of the service in sequence diagram, those operations will be automatically generated. And this will be done in coming sections. Multi-party service contracts are those involve two or more participants. 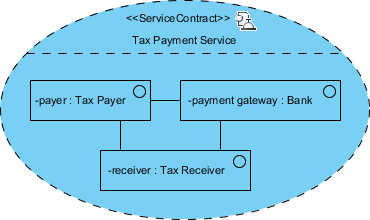 Let's draw a service contract diagram for the tax payment (multi-party) service. 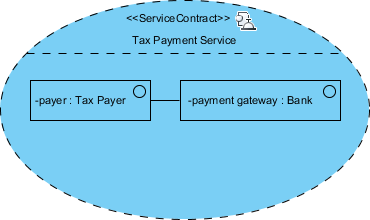 To create a service contract diagram, select Diagram > New from the toolbar. In the New Diagram window, enter Service Contract Diagram in the search field, click Next. Then, fill in the Diagram Name and Description (if any), click OK to confirm diagram creation. 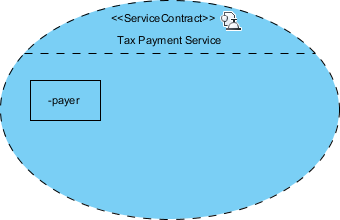 Select Service Contract from the diagram toolbar and click on the diagram to create a service contract. Name it Tax Payment Service. 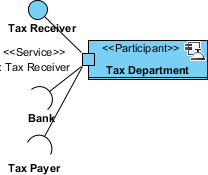 Visualize the roles of participants in the tax payment service. Click on the New Role resource to create a role in Tax Payment Service contract. Let's type the role. Right click on the role and select Select Type... from the popup menu. 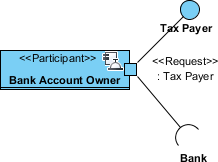 In the Select Type... window, select Tax Payer and click OK.
Visualize the role of bank. Make use of the Connector -> Role resource to create a new role from the payer role. In the Select Type... window, select Bank and click OK.
From the role payment gateway, create the role receiver. Select Tax Receiver to be its type. In a multi-service contract, the communication between parties and the choreography can be shown in an interaction diagram. Interaction diagram like UML sequence diagram shows who calls who and when the calls are made. 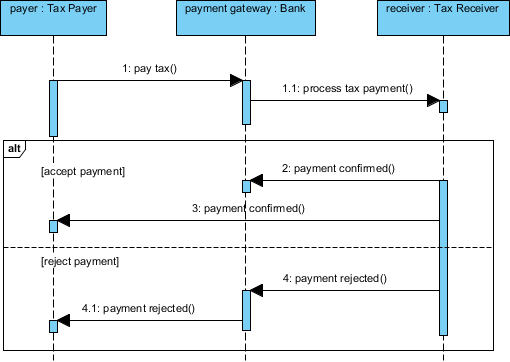 Let's draw a sequence diagram to specify the choreography of the tax payment service. Click on the service contract Tax Payment Service. Click on the tiny resource icon at the bottom right of the shape and select New Diagram... from the popup menu. The New Diagram window is opened. In the New Diagram window, enter sequence diagram in the search field, click Next. Then, fill in the Diagram Name and Description (if any), click OK to confirm diagram creation. Create three lifelines in diagram. Name them payer, payment gateway and receiver. Set the classifier for the lifelines. Right click on the payer lifeline and select Select Class > Select Class... from the popup menu. In the Select Class window, select Tax Payer and click OK.
Set the Bank and Tax Receiver to be the classifier of payment gateway and receiver lifeline. Time to model the interaction between the lifelines. The interaction starts with a payment request made by the payer on a bank account. So, create a message pay tax between payer and payment gateway. In order for 'pay tax' to be an operation in the Bank interface, we have to create an operation from the sequence message. Right click on the message and select Select Operation > Create Operation "pay tax" from the popup menu. Having received the payment request, the bank will request the tax receiver to process the payment. 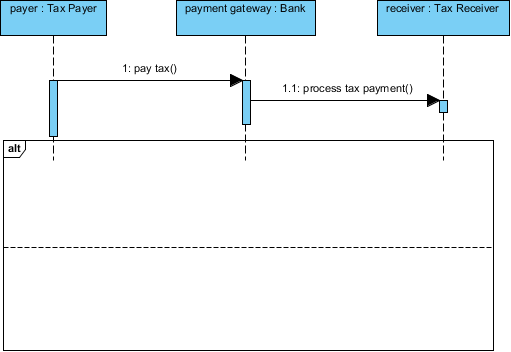 Create a message process tax payment from payment gateway to receiver. Again, create an operation from the message. If the payment is made correctly, the tax receiver will send a confirmation message to both the bank and the tax payer. Otherwise, the tax receiver will send a reject message to the bank and the bank will forward the message to the tax payer. To represent a conditional flow, draw an alternative combined fragment that covers the lifelines. Right click on the alt tag at the top left of the combined fragment. Select Operand > Manage Operands... from the popup menu. Enter the constraints of both operands in the Manage Constraints window. For the first operand, enter accept payment to be the constraint. For the second operand, enter reject payment to be the constraint. Click OK to confirm the change. When you draw the UML sequence diagram, you have created operations for the three lifelines. If you check the service interface diagram now, you can see the interfaces have operations listed. In a multi-party service, each participant provides their own interface and uses the interfaces of the other parties. This information can be represented with a service participant diagram. Let's draw a service participant diagram. To create a service participant diagram, select Diagram > New from the toolbar. In the New Diagram window, enter Service Participant Diagram in the search field, click Next. Then, fill in the Diagram Name and Description (if any), click OK to confirm. There are three participants in the tax payment service, the bank account owner, online bank and the tax department. Draw them in the diagram. The bank account owner is a consumer of the tax payment service. Create a <<Request>> port in the Back Account Owner participant. You can create a <<Request>> port via the resource centric interface of a participant. Let's type the port. Right click on the port and select Select Type... from the popup menu. In the Select Type window, select Tax Payer and click OK. 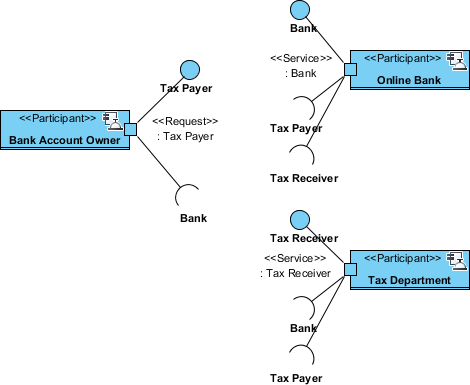 The bank account owner provides its interface, which is the Tax Payer interface, and according to the interaction modeled in the UML sequence diagram, we know that it uses the Bank interface. Draw the provided interface from the <<Request>> port first. Name the interface Tax Payer. Draw the required interface from <<Request>> port. Name it Bank. The participant Online Bank is a provider of the tax payment service. Create a <<Service>> port in it. Then, select Bank to be the port type. Online Bank provides the Bank interface and uses both the Tax Payer and Tax Receiver interface. Draw the provided and required interfaces. For this special case, you have to draw two required interfaces for the Tax Payer and Tax Receiver interfaces. The participant Tax Department is also a provider of the tax payment service. Create a <<Service>> port in it. Then, select Tax Receiver to be the port type. Tax Department provides the Tax Receiver interface and uses both the Bank and Tax Payer interface. Draw the provided and required interfaces. Tutorial - How to Draw SoaML Diagrams?